An advisory committee has ranked Legere Park as the No. 1 site for a skate park, but some Knightville neighbors say it's the wrong location. 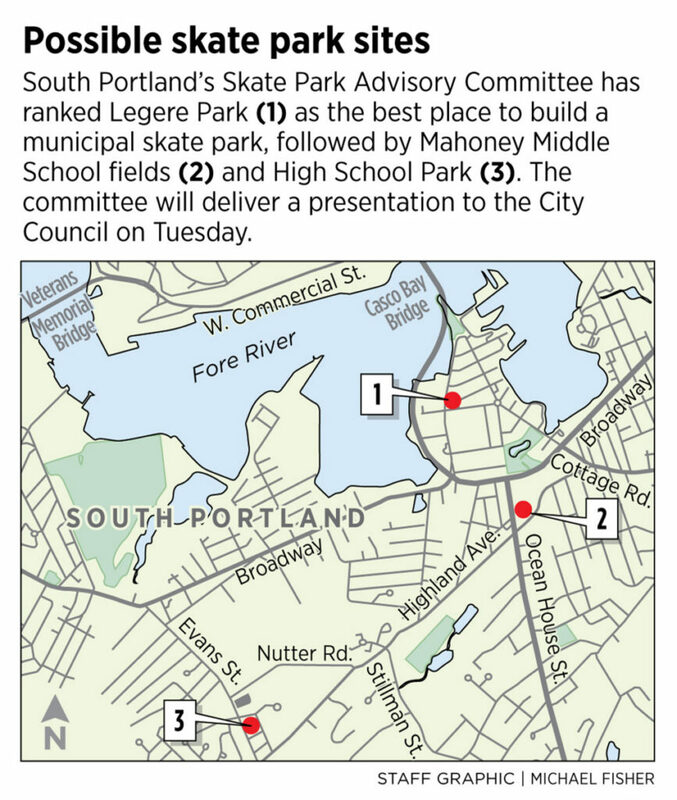 SOUTH PORTLAND — An advisory committee will formally pitch Legere Park as the best site for a municipal skate park at Tuesday’s City Council meeting, finally airing the subject of a community dispute that’s been simmering for months. Residents and business owners near the park on Waterman Drive have organized to oppose the No. 1 ranking, saying it contradicts the city’s efforts to revitalize the increasingly popular Knightville neighborhood and Mill Creek shopping area. Appointed last summer, the 10-member Skate Park Advisory Committee has studied and ranked 20 sites across the city according to certain criteria. It will present its top three sites – Mahoney Middle School fields, near Broadway and Ocean Street; High School Park, near Highland Avenue and Evans Street; and Legere Park, in ascending order – at 6:30 p.m. in the council chamber at City Hall. The committee’s results and the neighborhood’s response aren’t surprising. Legere Park has been discussed as a possible location since the council received a petition calling for a skate park in 2017 that was signed by 577 people. Now, the committee is seeking feedback from the council on what it has done so far and what it should do next. “It will be up to the council to guide them on whether we want to pursue one or more of the top-rated sites, or pursue one of the sites that did not rise to that level,” said Councilor Kate Lewis, who sits on the committee and represents District 2, where Legere Park is located. Lewis said she favored a site other than Legere Park among the five top-ranked sites, which include 360 Main St., behind the Cash Corner Fire Station (No. 4), and the South Portland Municipal Golf Course (No. 5). Still, she insisted that all sites be considered equally “to show we did our due diligence and didn’t play favorites.” Lewis said she would discuss her favorite site at Tuesday’s meeting. Lewis noted that Legere Park ranked higher than other sites because, in part, committee members believed the skate park would qualify for federal Community Development Block Grant funding if it were built in Knightville. However, Lewis said she believes that funding could be in jeopardy because income levels in the sought-after neighborhood have increased in recent years. Skate parks typically consist of wooden or concrete ramps, half-pipes and bowls, where people ride and perform stunts with skateboards, bikes, scooters and other wheeled vehicles. Often promoted as an alternative to riding on sidewalks, stairs and other public spots, they also frequently raise concerns about cost, upkeep, noise, crime and other public safety issues. The advisory committee ranked 20 possible skate park sites according to overall visibility; pedestrian, street and greenbelt access; and proximity to schools, parking, public transit, emergency services, bathrooms and food sellers, according to the committee’s report. While the committee gave credit to several sites that likely would be eligible for CDBG funding, it didn’t rank the sites on the potential cost of building a skate park at each location. It considered prefabricated, concrete and indoor skate park options that would measure 5,000 to 11,000 square feet and cost $250,000 to $500,000. The committee also considered whether the sites have buried utilities or pose a flood risk but found that few do. Half of the sites were eliminated because they are located in water resource protection areas, have easement issues or face other constraints. Legere Park ranked No. 1 because it’s a highly visible location on Waterman Drive, near public transit, street parking and other amenities, according to council agenda documents. “It’s in the middle of everything,” said Jeff Woodbury, an advisory committee member who skateboards regularly with his teenage son and daughter, often at skate parks in Portland and Scarborough. Melanie Wiker is one of 25 Knightville residents and business owners who are working to update the city’s comprehensive plan for development in the neighborhood. Wiker said a majority of the group supports building a skate park in South Portland, just not at Legere Park. “It’s not a central location and it’s not part of the vision for the revitalization of Knightville,” Wiker said. She and several other members plan to share their concerns at Tuesday’s council meeting, she said. Wiker said the Knightville comp plan committee is working to upgrade the use of Legere Park, which is one of the few green public spaces in the city’s village center and has few children living nearby. She said many of her neighbors are concerned that a skate park would attract hundreds of skaters from other communities and create a variety of public safety problems, including noise, traffic and graffiti. Wiker also questioned how the advisory committee could rank Legere Park as No. 1 without conducting a feasibility study to determine whether the site was actually suitable for a skate park. City officials recently authorized $15,000 in CDBG funding for a skate park feasibility study. City Manager Scott Morelli has recommended funding an additional $25,000 in planning and design costs through the fiscal 2020 capital improvement plan.